Within the world of robots and drones, there is a growing trend toward tailing you—with your permission in this case. It’s great for recreational use, where unmanned aerial vehicles, equipped with GoPro cameras, create mesmerizing video selfies for far less than the cost of renting a helicopter and hiring a film crew. 3D Robotics’ Iris+ drone and its DroidPlanner 2.0 software have a “Follow Me” mode for just these kinds of shots, as do models from Hexo+ and AirDog. And this being the mobile era, the Iris+ and Hexo+ work their magic by connecting to your smartphone and using its GPS data as a flight plan. The AirDog system requires wearing or carrying a little wireless module called an AirLeash. Such tech makes sense in a drone, but more and more terrestrial machines are adopting “follow the leader” functions. For example, the CaddyTrek schleps your clubs around the golf course by tracking a belt-mounted module that doubles as a remote control. Yes, it’s been out for a few years, but a new wave of loyal ‘bots that shadow you is right around the corner. The use cases extend beyond entertainment. 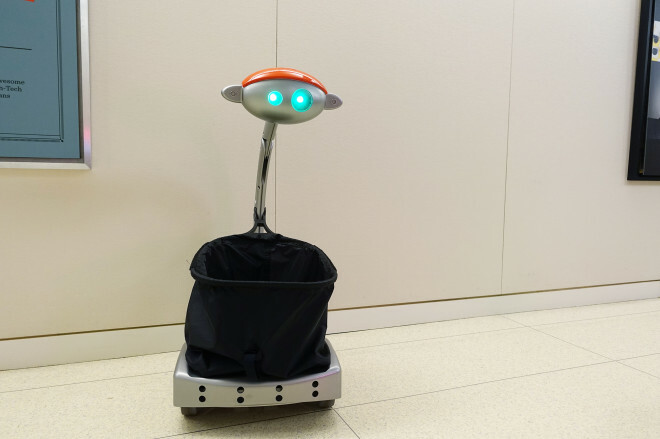 Five Elements Robotics’ Budgee, a “friendly robot assistant” designed for the elderly and handicapped, is a lightweight pack mule with a top speed of 2.4 mph. If you’re walking too fast for it to keep up, it’ll say so, with an app that lets you tailor the message. You can also program the color of its eyes, which have different sizes “inspired by my daughter’s sock puppets,” says Five Elements CEO Wendy Roberts. The sensor technology uses sweeping lasers to sense and calculate 3-D objects in front of it, and it is incredibly hard to shake once it’s following you. Despite being 20 inches tall, it’d be a nightmare playing hoops against the HV-100. It sticks to your every move like gum on hair. If you get freaked out or, more appropriately, there’s an emergency, there’s a big orange pull-stop on top. Yank it and the robot shuts down immediately. The company’s new robot, currently a prototype, is designed for warehouses and manufacturing plants. It’s expected to be cheaper: Harvest Automation has ditched the line-following LED sensors in favor of LIDAR alone. Grinnell says factory-friendly bots don’t need the same taped-off guide lines. 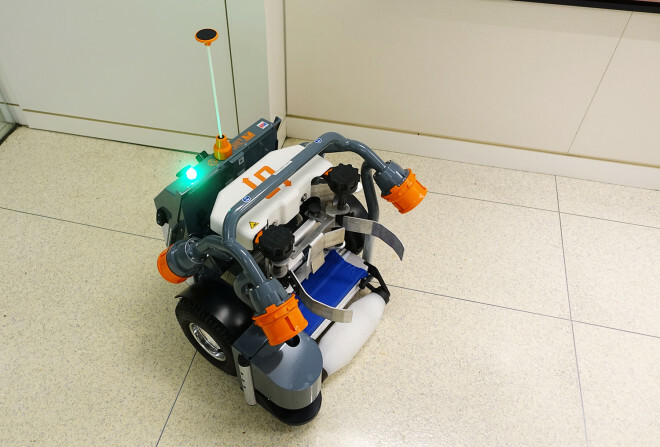 Budgee and Harvey will be on display alongside robots and related tech from 80 other companies at the 10th annual RoboBusiness 2014 conference. As robotic development has evolved and become more affordable, that show has grown quickly. According to Rich Erb, general manager of show-organizer Robotics Trends Media Group, attendance has grown more than threefold in the past three years. In 2011, there were 300 attendees of the show. This year, more than 1,000 people from 22 countries are registered.